Jacob Sztokman with students enrolled in GPM-assisted schools. All photos courtesy of Gabriel Project Mumbai. “What is your dream? What do you want to become?” asks Cochin-born Leya Elias, 23, a program coordinator for Gabriel Project Mumbai (GPM), a four-year-old Jewish initiative that is the brainchild of Jacob Sztokman, 45, an Australian-born Israeli. The children clamor to give theiranswers. “I want to be a teacher, to teach another child,” one says, standing up proudly. “I want to be a soldier, to protect the country and catch the robbers,” answers another. 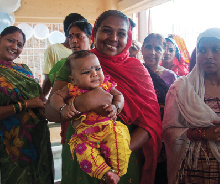 GPM is supported by a variety of Indian and Jewish social justice and women empowerment organizations. In 2011, while Sztokman was working for an Internet security company, he visited the slums and was appalled to learn that they are home to seven million children. In Kalwa alone, 120,000 people (40,000 of them children), originally from rural areas, are crammed into two or three square miles with limited access to food, water, electricity, sanitation, education and health care. Children as young as 4 work as ragpickers and sewage cleaners, earning a few rupees to help their families survive. Sztokman abandoned his high-tech career to create GPM. Its mission is simple: Eat to learn. “Education is the only way to break the cycle of poverty—and food is the incentive for the parents,” he says. Nutritious daily meals delivered to 1,000 children (500 in Kalwa, the rest throughout Mumbai) in 25 classrooms run by Reach Education Action Programme (REAP), a local NGO and one of GPM’s partners, encourage parents to send their children to school; attendance has increased by 50 percent since GPM began collaborating with REAP. About 150 women in the slums are paid to prepare and cook meals; running the enterprise as a co-op empowers them and increases their financial independence. Twice a week, GPM volunteers work side-by-side with them in the home of one of the women. They wash rice, make chapatis and separate hundreds of bananas into baskets for distribution with the hot meals. The women stir vats of sweet jaggery, spice vegetable curries with chili, turmeric and cumin and chat noisily. Meals for students are prepared in a women’s co-op. Sztokman added one more piece to the program: GPM would also revolve around the vision and energy of young adults, who would simultaneously learn first-hand about global responsibility and tikkun olam. He hired members of the Mumbai Jewish community to staff the organization; created an international volunteer track in collaboration with Entwine, the young adult program of the American Jewish Joint Distribution Committee, another partner; and later introduced an internship program for Indian Jewish students and young professionals. More and more, Jews are doing it. GPM is one of several global projects run by Jewish entrepreneurs trying to bring social change to communities beyond their own. A study by Olam, a new initiative promoting global Jewish service, identifies over 40 Jewish organizations that address challenges like disease, poverty and hunger. “Jews have a duty to help all human beings who are vulnerable,” explains Sztokman, who named the project after his grandfather as well as Gavriel Holtzberg, the Chabad rabbi who was killed in the 2008 terrorist attack on Mumbai. About 30 volunteers come to GPM each year—they have hailed from the United States, Canada, Australia, England, Italy, Israel and the Czech Republic and spend two months learning about global poverty, international development, Indian culture, Hindi and Marathi (the local languages), Indian Jewish history and the Jewish ethics of social justice. Bombarded by children asking for high-fives and handshakes each morning, the volunteers enrich the basic REAP curriculum of reading, writing, math and English, with informal lessons on art, music, science, geography and more. They sing, play games, conduct simple experiments and communicate through the help of GPM’s translators and teachers. “My Jewish identity was already strong but I left with a feeling of consistency and fulfillment,” says Melissa Rutman, 26, a New York resident, Jewish day school graduate and law school graduate who volunteered in 2013. Rutman describes herself as the granddaughter of survivors, raised in a Conservative home with the values of hesed and tzedaka. She searched out a direct-service program while working in a corporate law firm, where she felt “somewhat disconnected” from social justice projects. Mumbai-born Kurulkar shares Rutman’s perspective. “We learn so much from the kids,” she says. “I was born into a good family with good ethics. I didn’t think twice about the food on our table. Now I’ve witnessed things that have changed my entire outlook.” Kurulkar has a bachelor’s degree in biotechnology from Mumbai University and ran Jewish youth activities for the JDC. David Ramrajkar is a translator and teacher as well as the volunteer liaison and one of two security officers. A graduate of the local Jewish high school and a former sales executive, Ramrajkar, 34, also volunteers with the Indian Jewish Security, which guards Jewish organizations around Mumbai. The children call him Salman Khan (a well-known Bollywood actor he resembles) and hold fast to his legs to prevent him from leaving at the end of class. “Whenever I enter the classroom I forget the world,” he says. 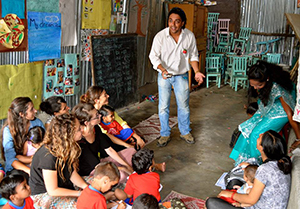 “The children develop a huge emotional connection with the volunteers that helps motivate them to want to learn, grow and engage with the world,” says Elias, who has a master’s degree in public relations and corporate communications. It also has a huge impact on the volunteers. GPM inspired Winchester, 24, to change her career focus to nonprofit work; she is currently communications and marketing coordinator at Areyvut, a New Jersey nonprofit that connects Jewish youth and teens to tzedaka and tikkun olam activities. Despite the children’s happy demeanors, harsh realities intrude. Winchester didn’t know why one student stopped coming to class until she bumped into him carrying two jugs of water. He had stopped attending because it was his responsibility to make sure his house had water. Girls have it worse. Some are married off early; some work as indentured servants or prostitutes to survive. Lack of education engenders high fertility and infant mortality rates. GPM participant Melissa Rutman, with Mumbai children. Interfaith relationships flow naturally from GPM’s work. REAP, its nondenominational partner, was founded by Father Trevor Miranda, a Jesuit priest. “There is no word for anti-Semitism in any of the 37 languages in India,” Sztokman says, pointing out that India’s population is about 80-percent Hindu, 18-percent Muslim and 2-percent Christian. “It’s a religiously pluralistic society and everyone is accepted.” The caste system, though officially outlawed, still has a pervasive impact. People from lower castes live in the urban slums, and there are quotas for members of disadvantaged groups in government positions and universities. Along with a strong commitment to their community, GPM staff struggle with plans for the future. “Indian Jews are dwindling day by day,” says Elias. “I feel very sad about it but, at the same time, I am working for [the Jewish future] through GPM. I can’t do anything for the [Cochin] community—there are only 29 Jews and little Jewish life…. But in Mumbai there is still a community of 4,500 and the youth can make a big difference.” Her father, a leader in Cochin, is advocating for her to make aliya, where her sister is a student at the Technion in Haifa. “I have to see; I’m not sure,” Elias says. Today, most Indian Jews have relocated to Israel. “That’s our place, our country,” says Kurulkar. “On a practical level, it will be a better life.” But then, she thinks about the rich history of her Bene Israel community. As part of their education about Indian Jewish history, volunteers take a trip to the Konkan coast, where, according to tradition, seven couples on a boat escaping Hellenist persecution in Israel survived a shipwreck over 2,000 years ago. They visit an ancient cemetery where the survivors are said to be buried. Shravan Sharma was only 11 when he died in June 2014. No one is sure of the cause, but the fever that preceded his sudden death might have been diagnosed and treated had there been accessible health care nearby. A clinic named and opened in his memory in August hopes to prevent similar tragedies. The clinic is providing sick visits, minor acute care, treatment for burns and injuries, immunizations, health and nutrition education, prescription assistance, preventive checkups, referrals to specialists, workshops on disease prevention and healthy living and more. A special fund will subsidize advanced treatments outside the two-room center. Staff doctors and nurses will serve an estimated 45 patients a day—about 200 patients a week, or almost 10,000 women and children a year. A community outreach team of local women led by a social worker is being trained as health representatives who will go house to house giving vaccinations and providing basic health-care education. 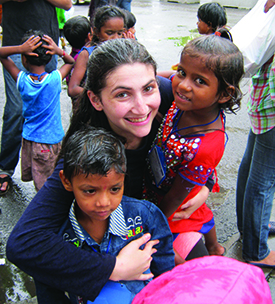 Rahel Musleah (rahelsjewishindia.com) leads trips to Jewish India.